Daily: Departure time varies depending on booking company, either 11.45, 12.00 or 12.30 - Double check your booking confirmation or the cruise booking site to confirm. Summer - There's no better way to see London than on a sunny day with clear blue skies as you cool down on the water. 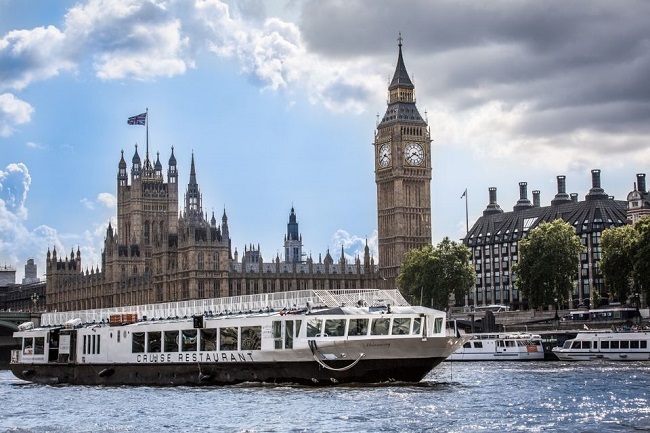 We are comparing Thames Lunch Cruise with 2-Course Meal Prices from leading ticket suppliers and Try to find you Cheap tickets prices on the market. A sophisticated 90 minute cruise down the River Thames with a delicious 2 course meal cooked and served onboard. Though subject to change, the classic lunch menu consists of delights such as roast chicken or English lamb rump or, for the vegetarians, pumpkin tortellini or roasted vegetable tart. For dessert expect something fruity or chocolatey; cherry tart or chocolate truffle cake followed by fair trade coffee and tea. The river boat, a moving restaurant on the water, has large windows for panoramic views plus outside deck area. A lovely way to spend a sophisticated afternoon whether you're a first-time visitor to London or a local looking for a lovely way to spend an afternoon. Great for couples and friends who are celebrating whether that be an anniversary, a birthday, or something else. Parents with children under the age of 3 are discouraged from bringing them along as bassinets, buggies, and prams are not allowed onboard. Your Experience With Thames Lunch Cruise with 2-Course Meal? Board the river cruise at the designated pier where the crew are waiting to welcome you and get settled at your table for a fabulous 90 minute cruise down the River Thames. A seasonal 2 course lunch with tea and coffee to follow will be served as you float down the river, passing by London's most iconic riverside sights. Drinks are not included in the price of the ticket but can be purchased from the bar onboard whether you fancy an ice cold beer, a bottle of wine, or a soft drink. From the open top deck or from your seat in the lounge you'll see Big Ben and the Houses of Parliament, the London Eye, St. Paul’s Cathedral, the Tower of London, Tower Bridge and other top London attractions pass by. The cruise is a round-trip so you'll be able to view both sides of the river at your leisure, arriving back at the departure pier mid-afternoon. What Thames Lunch Cruise with 2-Course Meal Includes? 90 minute lunchtime river Thames cruise. Audio commentary describing the sights you are passing and their history. Arrive early and ask for a window seat but avoid the window seat if it's a very hot day as you'll get too hot with the sun reflecting off of the water. Travelers Reviews about Thames Lunch Cruise with 2-Course Meal? Receiving mostly 4 and 5 star reviews people talking about this tour on Get Your Guide, Viator, and Trip Advisor report having a lovely afternoon with a delicious meal and overall great service from the staff from boarding to dining. People have said "It was beautiful seeing London from the river" and "The lunch cruise exceeded my expectations!" Some passengers report not being able to hear the commentary over the conversations of other diners and a slow drinks service but this did not effect their overall enjoyment of the cruise. Most visitors would recommend this cruise to others and would like to do it again themselves. Arrive at the pier 30 minutes before departure time. Be prepared to buy your drinks, even soft drinks as (apart from after dinner tea and coffee) they're not included in the price.